Use strong verbs and the active voice. Make the subject perform the action in sentences to keep them shorter and more impactful. The active voice requires fewer words to communicate the same idea as the passive voice.Passive Voice: The brakes were slammed by Nancy as the car sped down the hill. Active Voice: Nancy slammed on the brakes as the car sped down the hill. Change the order of the subject and verb, use clauses and vary your sentence opening (do not always use The, It, This, or I). 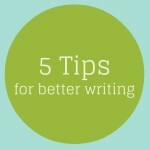 Good writing has a rhythm, which can be achieved through the use of creative vocabulary and varied sentence structure. To check if your work has good rhythm, go to #3. When you listen to the words you have written, you are able to “hear” the rhythm of your writing and can quickly identify if your writing sounds awkward or redundant. Imagine all the key questions the reader would ask about the subject matter and answer them in the simplest language possible. Try to write for the education level of the audience. Always have another person review your work to identify any problems. Deadline permitting, get away from the first draft (at least a few hours – the more the better) then read it with fresh eyes. Rinse and repeat.